Zia Pueblo, in north-central New Mexico, has maintained its tradition as a leader in the production of excellent ceramics, continuing the finest of the time honored features in a sequence of styles that show virtually no European influence and little curio-market degeneracy. 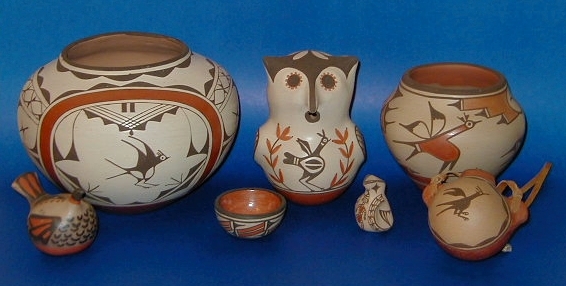 Matte-paint styles of Pueblo pottery decoration originated late in the seventeenth century, replacing an earlier glazeware tradition. The first type is know an Puname Polychrome (1680-1740), while its descendant, San Pablo Polychrome, bears an old Spanish name for the pueblo of Zia. As at most other pueblos during this period the designer of pottery were much preoccupied with the feather symbol. At Zia, especially, this sacred motif was painted on almost every surviving eighteen-century vessel in various modifications. Until about 1765 all these vessels were endowed with one feature that is particularly useful for dating purposes: The rim top was always painted red. After that date, during the last three decades of San Pablo Polychrome and thereafter, the rim tops of Zia vessels have always been painted black. The state of New Mexico adopted the Zia sun symbol in the 1920's from this Keresean speaking pueblo located 17 miles (27 kilometers) northwest of Bernalillo. The pueblo is situated beside the Jemez River atop a small mesa which provides a spectacular view of the surrounding areas. It is no wonder that Zia lands have been used in numerous films and television commercials. Zia women are known for their thin walled pottery usually decorated with Zia bird symbols. Other traditional crafts can be purchased at the cultural center located at the administration complex.